Last year, on December 11th, the United Nations declared June 21st to be International Yoga Day. This year marks the very first day of this annual occurrence from here on out. This is something to be celebrated as it goes to show and prove that people are taking notice of yoga. This traditional practice is keeping up with modern times and being recognized for the value it brings to so many people’s lives. Yoga is whatever yoga is for you. It can be spiritual or physical, it can help to restore your health or perhaps allow you to face other challenges in your life. Sometimes people go seeking yoga and other times yoga finds us. It is a journey of oneself but there are times when it brings people together. Yoga does mean “union” after all. In saying all of this, I wanted to mark this momentous day with a special event. Although yoga has been building up hype in the trendy circles these days, I still believe it is something that should be accessible to all people. Sometimes it’s difficult to make it to a class or we can’t afford to get into a studio. Maybe you’re even self-conscious about going to a class because you are afraid of being “bad” at yoga or you think it’s important to be wearing the most fashionable gear to wear to class (Note: wearing Lululemon pants won’t allow you to suddenly touch your toes! 😉 ) Sometimes we find it easier to do things when we are doing something for someone else. We can often find ourselves sacrificing our own time, happiness, and even sanity to help others out instead of ourselves. However self-love is very important. If we don’t take care of ourselves, how are we meant to take care of others? 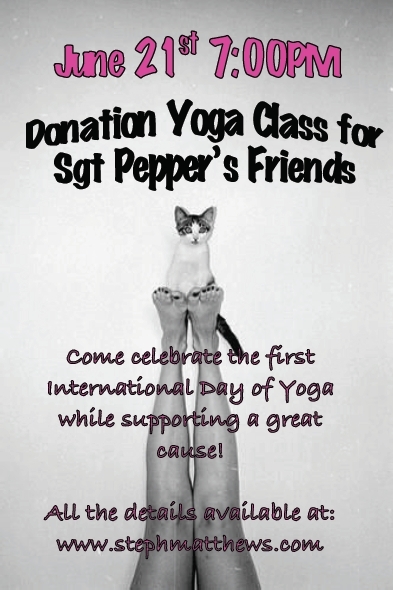 I’m asking you to come and join me for a day of yoga and in doing so, offering a donation to a foundation in the making. The foundation I have chosen is Sgt Pepper’s Friends. Perhaps you are already familiar with this but if not I will fill you in. This foundation is very new and still very much in the making. It has been started by a yogi named Rachel Brathen who you may know more familiarly as Yoga Girl. Rachel and her team have been working on this for the last few months, which you may have already seen if you follow social media. Sgt Pepper’s Friends is all about helping lost and stray animals come back to health and find their forever homes. It’s about animal rescue across the world. Although there are too many charities and foundations around the globe to count, this one was important for me because unlike us humans, animals don’t have a voice. We’re fortunate we are able to communicate our struggles and challenges however it’s up to us to be the voice for our furry friends. I have always adopted rescue animals and I think it’s important for there to be more resources to help them out. So please join me in doing something for yourself while also supporting a wonderful cause! The best thing about this event is it is a donation-based class therefore, you spend what you can afford. And if you’d like to give more to help this foundation, even better! Also, if there is any other way you think you may be able to help out or support the cause then please don’t hesitate to get in touch. You can contact me here: with any questions or comments. I would love to hear from you!